That was no surprise at all: In 1973 my high school band did a European tour and one thing most of the kids planned to do was buy some Pez dispensers to take home. In German Pez sounds like "pets." 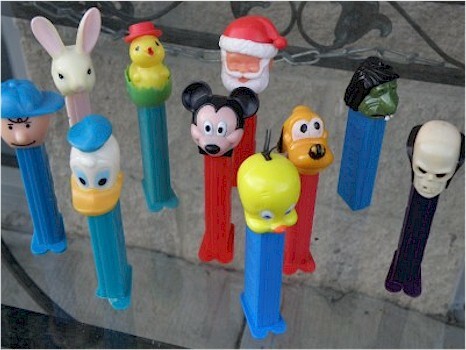 Just researched the history of Pez, and was surprised it began in 1927 Austria! The first plain dispenser appeared in 1948. I don't know why it wasn't until the late 50's that I and the kids in my neighborhood first discovered them. Perhaps they weren't distributed in my town until then. U.S. introduction, with plain dispensers, occurred in 1952, with character heads (Mickey Mouse, Santa Claus) being added in 1955. No comments yet on Pez? These were all the rage when they came out. I'm guessing about 1959. We ALL had to have them. The first dispensers didn't have characters on them, just a plain design in various colors. We thought this was so cool.